A lot of people think they can't afford a vacation. That might be the case if they want to travel to expensive destinations like Hawaii or Paris. But not all destinations are created equal. So the good news is the world is full of budget-friendly destinations just waiting to be explored. Here are 11 to get you started. If you're working on a shoestring budget, then look no further than Southeast Asia. While your flight might cost more up front, all other daily costs are very budget-friendly. For example, I traveled through Southeast Asia for over five months on only $25 per day, including flights and visas. As a side note, if you're planning to overland travel through India, take the train rather than a bus to avoid bumpy roads and pay a few extra dollars for an upgraded train car. A comfortable bed and a little AC are worth it. Most people think hiking in the Himalayas is expensive. Heck, climbing Everest can cost more than $60,000! But not all hiking in Nepal is expensive. I hiked the Annapurna Circuit — an 18 to 21 day horseshoe shaped trek that winds around the Annapurna mountain range in the Himalaya — for under $20 per day. And don't get suckered into paying for a porter and guide. They'll add to the overall cost, and they're not required. I haven't been to Hungary since 2000, but the prices haven't gone up much. You can get a decent hotel room for under $25 per night or relax at one of Budapest's thermal day spas for under $10. For some real savings consider getting a one bedroom apartment in the city center for about $300 per month! After traveling through Peru for a month in 2012, I was shocked at how reasonable the prices were. Most accommodations were under $20, and you could get a fresh bowl of ceviche for $5. Most people who visit Peru want to hike the Inca Trail to Machu Picchu, which is very pricey. If you want to hike, consider staying in the city of Huaraz which offers world-class hiking in the Cordelia Blanca mountain range. Because these destinations are budget-friendly, they're also very popular among tourists and have plenty of accommodations. In most cases, you won't need to book in advance (unless it's during a holiday or major event). If you're looking for a vacation rental, VRBO, Airbnb, and craigslist are good places to start. Always research the cost of visas and taxes, which vary depending upon what country you're from and what country you are visiting. For example, the entry cost for a U.S. citizen flying into Santiago, Chile is $160. These hidden costs can add up fast and blow your budget. In addition to where you travel, it's how you travel that can save you a significant amount of money. 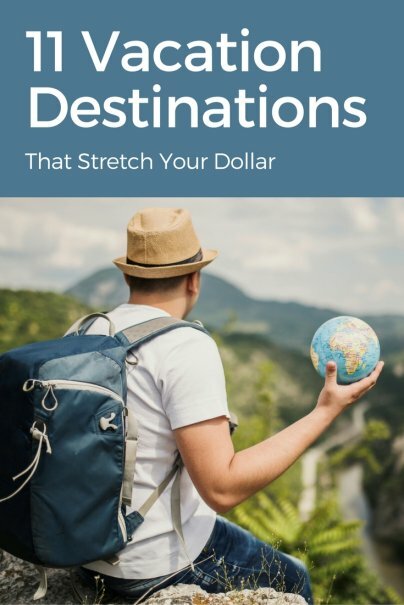 You can stretch your dollar all around the world if you travel with an open mind and open itinerary. Want to know the costs for another country? Numbeo.com is a handy website that lists the cost of living — including restaurants, transportation, and accommodations — for countries all around the world. Sort by cost and find your own value destinations, or compare a couple of destinations side-by-side and discover which is the better bargain. Where have you found great travel bargains? Lke this article? Pin it! Some good inspiration there for the next holiday!! I went to China earlier in the year and whilst the flights were expensive, the cost of accommodation and food/drink whilst there was more than enough to make up for it. Beware though, the costs are the same on the "tourist track". Make sure you go off-piste to eat and drink to experience the true local culture and the true local prices!